Hello! Juliet asked me to write some postings for her blog about nutrition labels and how to recognize unhealthy ingredients. Specifically, I'm going to focus today on two ingredients that Juliet avoids: sugar alcohols and trans fats. Just to be clear - I'm not a nutritionist, though I do know a lot about food and food makeup. First of all, everything you eat, whether it comes out of a can or out of the ground, is made up of four things: carbohydrate, fat, protein, and chemicals/food additives. Oh, and water. Everything you eat, liquid or solid, is actually mostly water. That’s why when you add up all the masses of everything on a nutrition label it usually falls well short of the serving size. That extra mass is water. It probably comes as no surprise that milk is mostly water, but even butter is 20-30% water, and meat is 65-75% water, just like our own bodies. Sugar Alcohols: A relative of the carb is the sugar alcohol. Sugar alcohols are sugar molecules with a small chemical modification that makes it harder for the body to digest them. They’re sweet and have fewer calories per gram than real sugar, which sounds like a good deal (and is why they are used in so many diet foods), except for the bloating, gas, and diarrhea they cause in some people. Almost all sugar alcohols have names that end in “-itol”, such sorbitol or maltitol. Trans Fats: Many processed baked goods rely on them to produce proper flavor and texture, and their greater chemical stability extends shelf-life. However, since they are not naturally-occurring molecules, our bodies are not designed to process them. Consequently, they tend to end up coating our arteries, and should be avoided entirely. In fact, California just announced a plan to become trans-fat free over the next few years. As a side note, naturally-occurring trans fats (such as those found in small amounts in dairy) are processed just fine by the body, and do not need to be avoided. When searching a nutrition label for trans fats, don’t just go to the Trans Fat line. If a serving has less than 0.5 g of trans fat, it is rounded down to 0g. Very misleading, and it means that not all products that say 0g on their nutrition label are actually trans fat free! To distinguish acceptable naturally-occurring trans fats from unhealthy processed trans fats, you have to read the ingredients list. If you see the phrases “partially hydrogenated”, “hydrogenated”, or “shortening” you should probably put down the box of cookies and walk away. On the other hand, if the label says “fully hydrogenated," or “trans fat free shortening” or if the package is labeled with the words "No trans fats," you should be good to go. ... Just thought I'd drop a note and say that unlike other sugar alcohols, erythritol is actually much more digestible, and doesn't cause intestinal problems. :) It also tastes great. 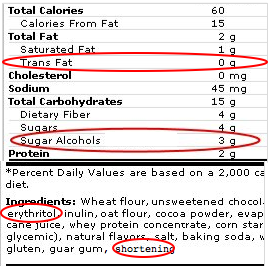 From what I understand, you are totally right about erythritol in small quantities vs. the other sugar alcohols. But unfortunately, it still has the same laxative issues in very large quantities because of how the body absorbs it (which people might accidentally eat without knowing, since it tastes so good and has so little calories). There is a nice article about this on wikipedia (http://en.wikipedia.org/wiki/Erythritol) if you are interested. This is an awesome post! I really liked how you made the chemistry accessible to people who may not have had organic chemistry. It was also very cool how you explained how the food industry rounds 0.5g down to zero. I did not know they followed their own rounding convention.